An original crochet amigurumi Sea Turtle pattern from the AquaAmi range by June Gilbank. 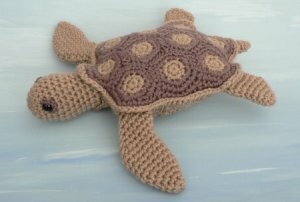 Crochet a stunning sea turtle with a beautifully patterned shell and realistically shaped flippers. Details: pattern is 10 pages long and includes over 20 step-by-step photographs and explanations so you can crochet a perfect sea turtle of your own. Yes, this is the turtle from my Discworld Project! Date Added: 10/14/2017 by Susan P.
Great pattern. Easy to understand with included pictures. Date Added: 08/01/2016 by Shas C.
Date Added: 04/04/2016 by Alexa B. Date Added: 08/25/2015 by Jaclyn M.
Date Added: 06/28/2013 by Sheryl W.
Date Added: 05/09/2012 by Linda U.